Gradients: I can't stop doin' them. Today's edition features two gorgeous scattered holographic shades from A-England: Dragon (the green) and St. George (the deep teal). I've worn both alone before. St. George is one of my favorite polishes ever and, in my opinion, is a must have in every polish lover's collection. 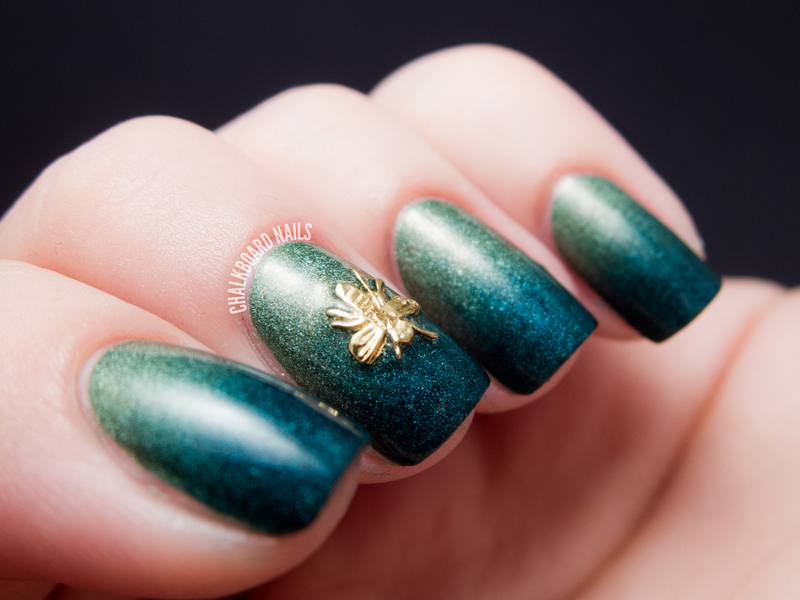 Dragon wasn't my favorite when I wore it alone but it paired absolutely perfectly with St. George in this manicure. I also chose to spice things up a little with the addition of a Hex Nail Jewelry Bee no.2 charm! 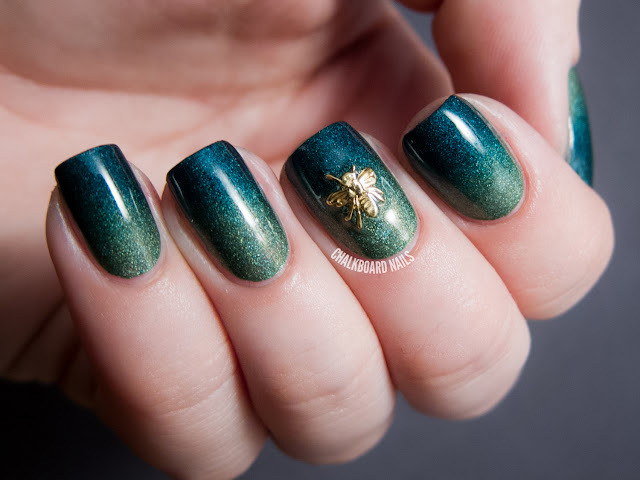 The golden bee adds the perfect amount of excess while still balancing focus with the gradient. To say I'm a fan is an understatement! If you have been considering making purchases from either of these brands, I would urge you to go for it. The A-Englands are obviously gorgeous but they also have fantastic formulas, too, & Hex's nail charms are just FUN. Perfect gradient! and that bee is adorable! I want one! I honestly really love the gradient! I think I'd wear just the gradient alone for like a month haha. This gradient is gorgeous!! I've yet to try my own gradient - I think I'd be terrible at it =/ Mess all over my nails. I also agree that St. George is breathtaking - from the pics I've seen, anyway. I just picked up Cirque Epoch and - aside from the duo-chrome effect - I was wondering how similar that polish is to St. George (in terms of the blackened dark teal)....? I am amazed by this manicure. Sooo beautiful, the gradient is really gorgeous! Gorgeous colors! They're so great together. St George is stunning! That's a good question -- I don't actually own Epoch! As for doing the gradients, you just gotta go for it! My early attempts weren't the prettiest thing, either. :) All about practice! I'd just need to swap the bee charm for their snake charm! I absolutely agree, it is perfect. And the bee is an original touch! Absolutely fabulous! I love that bee! It just matches perfect with the gradient. May gradients last forever. One of my favorite nail looks. This is beautiful! This is a fantastic combination, the golden bee is the perfect touch! I'm totally loving it! I lust after those Hex charms but know if I went to buy one, I'd end up buying them all and my bank balance just can't cope with that! I have no qualms saying that Saint George is the best polish in the world. Diatomaceous earth is the remains of fossilized algae. Hey! I simply would like to give a huge thumbs up for the nice data you will have here on this post. weird. With Ben 30 toys you would be ready to play anywhere and almost everywhere. these a englands look gorg together! What a subtle, beautiful gradient! This is amazing! Because of this I just visited Hex nails & bought up a whole lot of their goodies. Do you have a tutorial about how to do gradients? This is beautiful. I like A-England. Dragon and St. George are my favorites. How do you do your gradient? I just recently got a bottle of St. George last week. It's pretty, very pretty, but a little dark for my skin tone, so I'd love to do a gradient like this to brighten it up a bit. I tried the sponge method, but it looked too linear, if that makes any sense. It didn't fade right. Your advice would be appreciated! The key is multiple rounds of sponging, and bouncing the sponge up and down when applying. Move the sponge higher and lower up and down the nail to "blur" the line where the two polishes meet. Hope this helps!